Your complete and permanent satisfaction is of primary concern to Mazda. All Authorized Mazda Dealers have both the knowledge and tools to keep your Mazda in top condition. In our experience, any questions, problems, or complaints regarding the operation of your Mazda or any other general service transactions are most effectively resolved by your dealer. Discuss the matter with a member of dealership management. If the Service Manager has already reviewed your concerns, contact the owner of the dealership or its General Manager. If you feel that you still require assistance, ask the dealer Service Manager to arrange for you to meet the local Mazda Service Representative. If more expedient, contact Mazda Canada Inc. Regional Office nearest you for such arrangements. 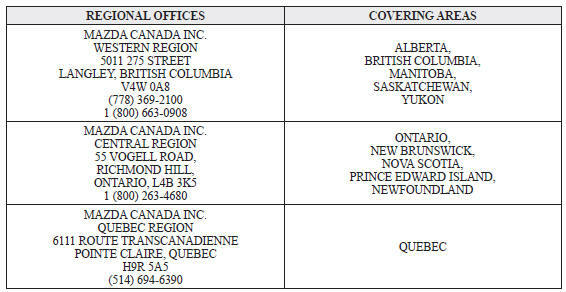 Regional Office address and phone numbers are shown . If still not substantially satisfied, contact the Customer Relations Department, Mazda Canada Inc., 55 Vogell Road, Richmond Hill, Ontario, L4B 3K5 Canada TEL: 1 (800) 263- 4680. Vehicle Identification Number (VIN). Refer to the “Vehicle Identification Labels” page of section 9 of this manual for the location of the VIN. The Department, in cooperation with the local Mazda Service Representative, will review the case to determine if everything possible has been done to ensure your satisfaction. Please recognize that the resolution of service problems in most cases requires the use of your Mazda dealer's service facilities, personnel and equipment. We urge you to follow the above three steps in sequence for most effective results. Occasionally a customer concern cannot be resolved through Mazda's Customer Satisfaction Program. If after exhausting the procedures in this manual your concern is still not resolved, you have another option. Mazda Canada Inc. participates in an arbitration program administered by the Canadian Motor Vehicle Arbitration Plan (CAMVAP). CAMVAP will advise you about how your concern may be reviewed and resolved by an independent third party through binding arbitration. Your complete satisfaction is the goal of Mazda Canada Inc. and our dealers. Mazda's participation in CAMVAP makes a valuable contribution to our achieving that goal. There is no charge for using CAMVAP. CAMVAP results are fast, fair and final as the award is binding on both you and Mazda Canada Inc. If a specific item of concern arises, where a solution cannot be reached between an owner, Mazda, and/or one of its dealers (that all parties cannot agree upon), the owner may wish to use the services offered by the Canadian Motor Vehicle Arbitration Plan (CAMVAP). CAMVAP uses the services of Provincial Administrators to assist consumers in scheduling and preparing for their arbitration hearings. However, before you can proceed with CAMVAP you must follow your Mazda dispute resolution process as outlined previously. CAMVAP is fully implemented in all provinces and territories.